VALUE Virtual labs is an initiative of the Ministry of Human Resource and Development, Govt. of India under the National Mission on Education through Information and Communications Technology (NME-ICT). This initiative is providing an opportunity for all the students of an institute to use virtual labs, free of cost under the Nodal Centre Program. It is to provide high quality remote laboratory access in Science and Engineering disciplines for students and teachers of the country through vlab.amrita.edu and is applicable to undergraduate (B.Sc., B.Tech, B.E.) and post-graduate (M.Sc., M.Tech, M.E.) students including Physical Sciences, Biological Sciences, Chemical Sciences, Computer Science and Electronics and Mechanical Engineering. Virtual Labs is being developed by consortia of 12 institutes which include Amrita Vishwa Vidhyapeetham, IIT Delhi, IIT Bombay, IIT Kanpur, IIT Kharagpur, IIT Madras, IIT Roorkee, IIT Guwahati, IIIT Hyderabad, Dayalbagh University, NIT Suratkal and College of Engineering, Pune. To share high quality laboratory resources, selected institutes can participate for the effective usage of Virtual Labs in their curriculum. It is an exciting new venture which allows institute to use virtual labs for the benefit of their students and teachers & provides a platform for everyone to contribute towards the future development of Virtual Labs . There is no registration fee for this program. We are looking for expressions of interest from reputed educational and research institutions for the establishment of Virtual Labs on their premises. Download the brochure on nodal centre program. All AICTE recognised institutes are welcome to apply for the program by submitting the implementation plan (in PPT format) and Expression of Interest (EOI) form. Institutes will be shortlisted based on their implementation plan. An instructor-in-charge (nodal centre coordinator)/principal/HOD will have to present the plan on implementing virtual labs for the institute for the upcoming academic year (August 2015-January 2016) to a review team of VALUE Virtual Labs. How can we apply for the Nodal Centre Program? Power point presentation in the prescribed format. Important- Send it for approval to virtual_labs@am.amrita.edu. Upon approval, send us the soft copy as well as the hardcopy of Supporting document for MHRD. The format will be sent to you along with the approval of your implementation plan. Choose at least three experiments from vlab.amrita.edu. The total number of students from an institute using virtual labs should be at least 300. You will have to present your plan on implementing virtual labs in the prescribed format quoting the distribution of students and the chosen virtual lab experiments at a nodal centre conference/online. We recommend you to conduct an interdepartmental meeting to finalize the implementation plan. 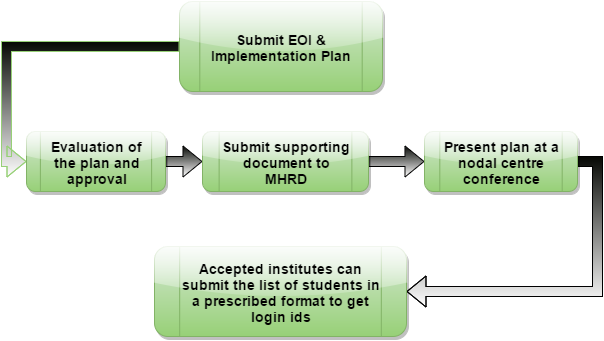 Unique login IDS will be provided to all students and faculty members of institutes meeting the minimum criteria. All your students and faculty should initiate their logins on vlab.amrita.edu within two weeks of receiving the login IDs.The student strength of your institute will also be calculated based on the total logins within this period. How can we initate virtual lab usage after receiving the login IDs? The nodal coordinator can conduct an introductory class on virtual labs after receiving the login ids.If you have not attended any of our workshops, you can also write to virtual_labs@am.amrita.edu to request for an online class through A-VIEW(web conferencing tool). Kindly note that the online class will be sanctioned based on the availability of virtual lab expert. Students can initiate their login IDs by completing the general online questionnaire available under physical sciences. This should be done within two weeks of receiving the unique logins. Your institute will be included under the provisional list of nodal centres based on the total logins during the above period. Exclusive features for faculty at Nodal centers viz. lab question paper development, setup of online lab exam for students, results reporting etc. All of these benefits are available to those institutions who meet the modest requirements and are selected to be Nodal Centres. Timings-10:00 am - 4:00 pm.